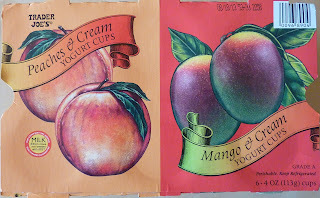 Many moons ago, we took a look at Trader Joe's Blueberries & Cream and Vanilla & Cream yogurts. They were both deemed delicious, thick, and among the best-tasting yogurt products that we've ever tried from TJ's. This other yogurt duo has some things in common with the blueberry and vanilla, and a few differences. Let's start with the commonalities. They're both beautifully-packaged, they're both ultra-thick and creamy, and they both have the word "and" mentioned three times in their product titles, though two out of the three are cleverly disguised as ampersands. They both come in small cups, but are still very filling. But unlike the blueberry and vanilla combo, this one features two flavors that wind up being a little too similar. Mango really shouldn't taste that much like peach. But in this case, Sonia and I both felt that it did. It's not that we couldn't tell the difference between the two flavors, because we could...but the mango flavor seemed, well, just a little peachy. Also both flavors look the same, too. They're just slightly different variations on this pastel shade of orange...I guess it's tangerine? Or coral? Saffron maybe? Anyway, that's beside the point I guess...the point is, you almost have to look at the picture on the cup to figure out which yogurt you're eating. Also beside the point is why "peaches" is plural and "mango" is singular. Is it because they used multiple peaches per cup but only one mango? My guess is that they went with "mango," singular, because they didn't know whether to spell the plural with an "e" or not: "mangos" or "mangoes." That zany mango presents quite a conundrum. And certainly, mango is the riskier of the two flavors. 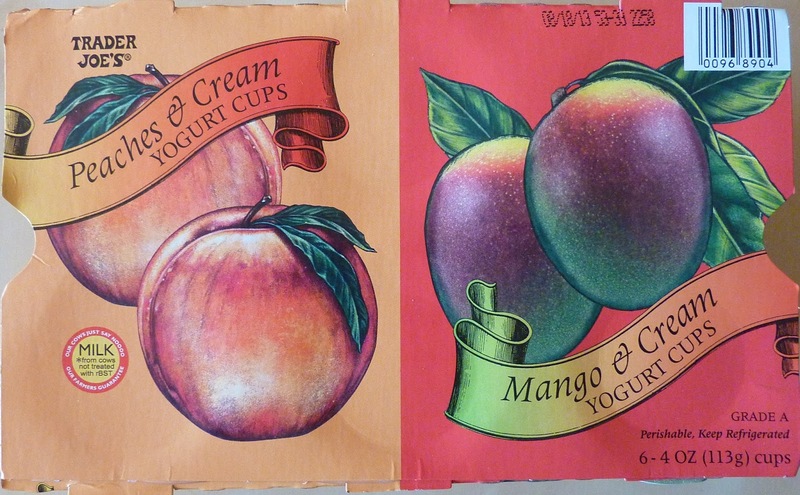 Peaches and cream is what started the whole "fruit and cream" craze. It's a classic. If you actually get the yogurt to taste vaguely of peaches and/or cream, you pretty much can't go wrong, and they nailed it. It's delicious. But in our opinion, the mango flavor tastes a bit like peaches and cream too. It's not like Trader Joe's doesn't know how to do mango. They've done mango gummies, mango juices, mango chocolates, and mango cereal, among other things. Just type in the keyword "mango" in the search box below the intro to our blog and four pages of mango-related products will pop up. And good or bad, virtually all of those products tasted like mango. But for once, Sonia and I actually wanted more mango flavor. And that's our biggest complaint. But still, this is a great product overall. If you're looking for a thick, sweet, dessert-like yogurt, look no further. You don't even really have to like mango. You just have to like peaches and cream. Sonia gives this product 4 stars. I give it 3.5. 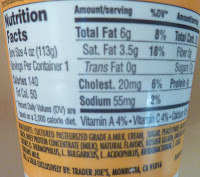 *Since the nutrition information is a little hard to see, here are some of the stats you might be missing: Total Carbs 20g, Fiber 0g, Sugars 17g, Protein 4g. Boo I wish it didn't have gelatin in it! All the varieties sound delicious. The gelatin isn't noticeable in it for me. I typically don't like that ingredient in my yogurt. 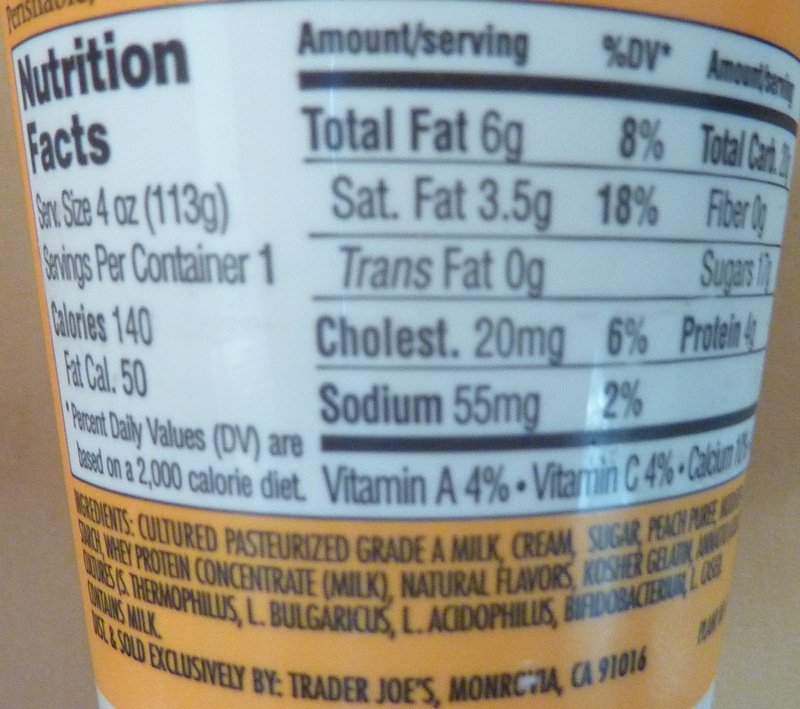 The point is, gelatin is a slaughterhouse byproduct, not vegetarian and certainly not needed in any kind of yogurt.